I was lucky enough to have an excellent seat at this year's final. Obviously I couldn't get as close to the action as the press photographers when it came to the presentations at the end. However, with my longer lens on (a 70–200mm zoom), I was still able to get close enough to take some pictures with nice detail. An advantage of my position was that I could include a lot of the crowd in the picture, which I always prefer to do as they are so integral to the occasion. 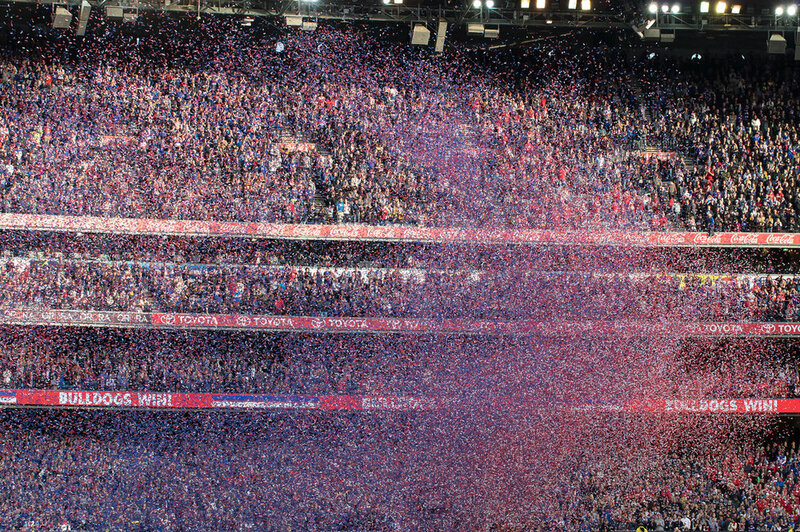 A few seconds after the streamers were released, the crowd and players are lost in colour. Of course I took plenty of shots, but in the end this one stood out. I've been fortunate to attend lots of Grand Finals so I know the order of things. I knew that the streamers were about to be released, and I knew that not long after they were released the players and crowd would be lost amongst them. So I had to time a picture between those two moments. Thankfully, the players were in a great celebratory pose at that moment too. I had my shot. In full colour. Now I needed to decide how to include it in my calendar in a way that would be consistent with rest of the images that are all just black and white. The solution I chose was to convert the image to black and white and then 'paint' back in just a bit of colour. Sounds tricky, but it doesn't need to be. When I covert my images to black and white I use Nik Software's Silver Efex Pro. I've used this application for years, but it's now available as a free download, along with the rest of the Nik Collection (which is owned by Google these days). One of the tools within Silver Efex Pro app is 'selective colorization', which effectively allows you to paint a selected colour back into a section of a picture. After fiddling with that for a few minutes, revealing a touch of blue and a touch of red, I had the effect I was looking for. It's not something I would use very often, but this time it helped me nicely blend the black-and-white and colour worlds. My 2017 calendar, 'Melbourne Classics', is now available for pre-order. ave a question? Feel free to ask in a comment below, or on my Facebook page.